Bergamot plant, Monarda didyma, is also known as Oswego Tea. Brewed leaves produce a tea which was consumed by Native Americans. Some British settlers also drank Oswego Tea after the Boston Tea Party in the 18th century. Leaves and flowers are used in salads and also as a garnish. Leaves have an exquisite aroma and are used in pot pouri. An American folk remedy for nausea or vomiting. A companion plant which attracts bees to the garden. Bergamot plant is native of North America and prefers light, well drained, moist soils in a protected, partially shaded position which receives morning sun only. Frost resistant but drought tender. 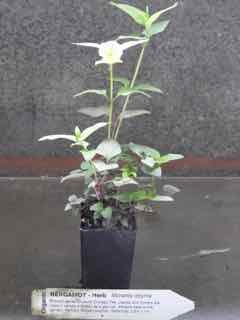 A perennial plant growing 0.6m x 1m. Scarlet flowers. Be the first to review “Bergamot, plant” Click here to cancel reply.